FFS often find ourselves moaning about the noise levels at lovely folk gigs where you want to be able to hear nothing but the singer’s voice or a pin dropping, but find yourself shushing those chatting behind you in a manner your primary school’s headmistress would be proud of. Which makes going to big, riotous, sing-along gigs all the more joyous. 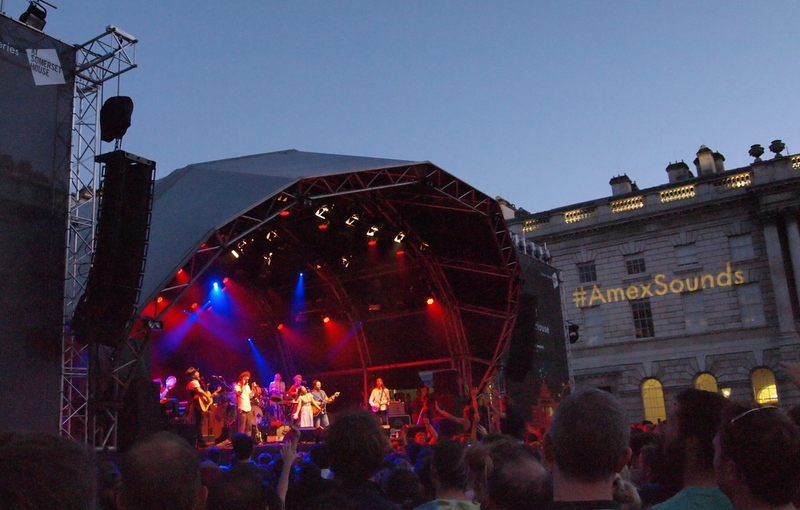 Sometimes even folk fans like to lose their voices shouting out a chorus, and that is just what Edward Sharpe and the Magnetic Zeros coaxed us into at their Somerset House Summer Series gig. Alexander Ebert’s roots are pretty straggly. He’s ended up making this rousing indie folk in the guise of his alter ego Edward Sharpe via wanting to be a rapper (as a teenager), three albums in the electronic rock band Ima Robot, his own indie rock album and a stint in rehab. As a result it’s a bit hard to accept his dreads-and-linen look, until he gets going and you decide you don’t care, because the guy is one hell of a frontman. His voice is strong and confident, the band obviously love him and he’s wading into the crowd by the second song; whether or not it’s an act, we’re sold. And the songs are bloody great live. The band are ten minimum, and make so much noise it feels rude not to get involved and have a great time. The big tracks from the first album – 40 Day Dream, Janglin – get the crowd particularly excited, and the first hour of the set is an absolute blast. After an hour and forty minutes we were flagging a bit; two albums isn’t really enough to keep an after-work crowd perky until 11pm, but we were rewarded with a ten minute epic rendition of Home, during which they invited members of the crowd to tell their stories. Never a good idea, and we giggled through the excitable microphone babble, but rather sweet nonetheless. We’ll be interested to see how many more hits Alex Ebert will pull out of the bag in his current incarnation, because he’s done a good job so far. 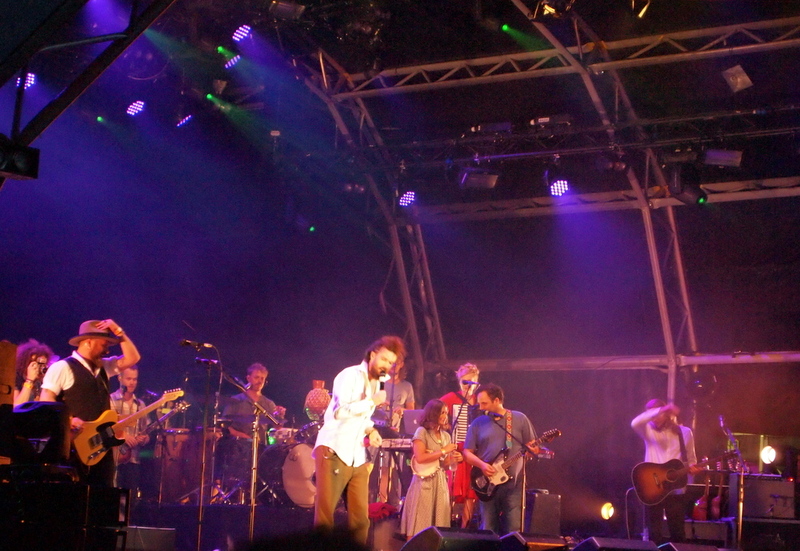 Edward Sharpe and the Magnetic Zeros are a band that can truly nail a live performance, with enough warmth to cheer even the most stern of music fans. Coupled with the stunning setting of the Somerset House courtyard it was all we could do not to shed a happy little tear during Home, but we were too busy trying to whistle and dance at the same time.